Crain’s Chicago Business has named Devbridge the 13th-fastest-growing company in Chicago. Crain’s announced its ‘Fast 50’ list at an awards luncheon in Chicago, Friday. Since 2007, the list has spotlighted Chicago-area companies with the highest revenue gains over a five-year period in business. Devbridge was ranked 13 on last year's 'Fast 50' list. In that five-year span, Devbridge has doubled in size annually, producing a growth rate of 1,082.8 percent. 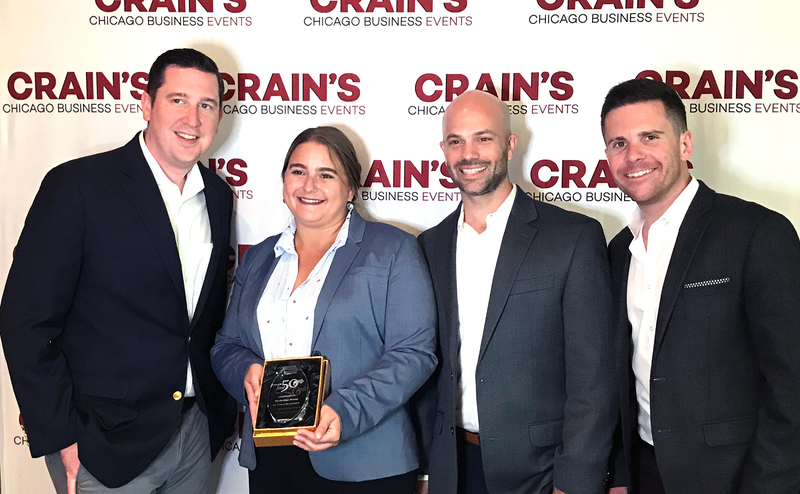 The Crain's award announcement came a week after Ernst & Young named Devbridge president Aurimas Adomavicius its 2018 Entrepreneur of the Year in the Midwest region. Devbridge, founded ten years ago, is headquartered in Chicago’s River North neighborhood, with additional offices in Canada, the U.K., and Lithuania. To be considered for the 'Fast 50' list, companies must be based in the Chicago area and have generated a minimum revenue of $15 million in 2017. You can view the full list of 'Fast 50' companies here. As we grow, so does our team. You can check out our open positions and apply here.